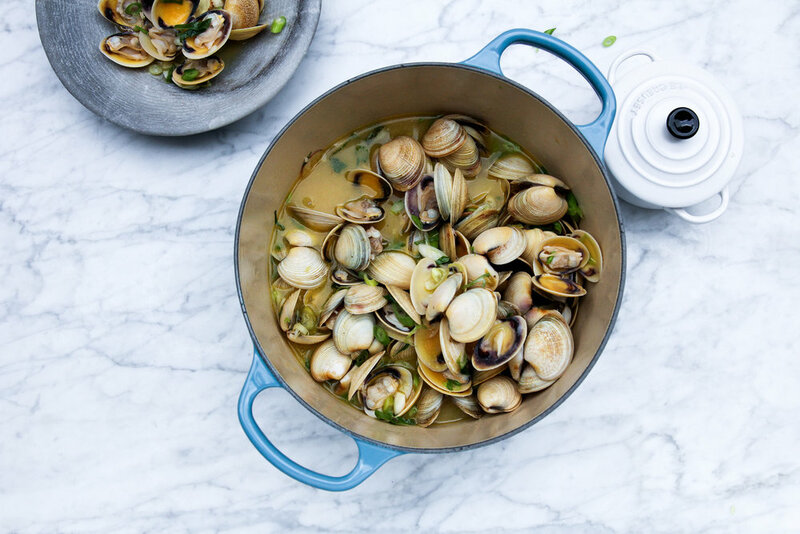 Even guests who can’t face a pot of mussels adore this rich, sweet dish of miso vongole. The miso makes it salty, and I love using local vongole or clams for their sweetness. You have permission to eat these numbers with your hands, and offer plenty of bread for mopping up those gorgeous juices. Thanks to Le Creuset for the beautiful cast iron pot to make these, appropriately in the marine blue colour! You can get one here! Add butter, ginger and garlic to a heavy-bottomed saucepan with a lid and place over medium heat. Cook 5 minutes until garlic is tender. Add vongole to the pan with the wine, stir to combine and cover. Cook 10 minutes, until vongole start to open. Remove from heat, add the miso and stir to combine. Garnish with spring onions, squeeze over lemon and serve.